NEW DELHI (AFP) – Sixteen-year-old schoolboy Nitish Kumar, the youngest player at the World Cup, was sent onto the pitch Monday as the Canada team faced Zimbabwe in a Group A game, first match of the day. The Ontario teenager, who opens the batting, has played five ODIs for Canada having made his debut against Afghanistan in Sharjah in February 2010. Zimbabwe skipper Elton Chigumbura won the toss and decided to bat. 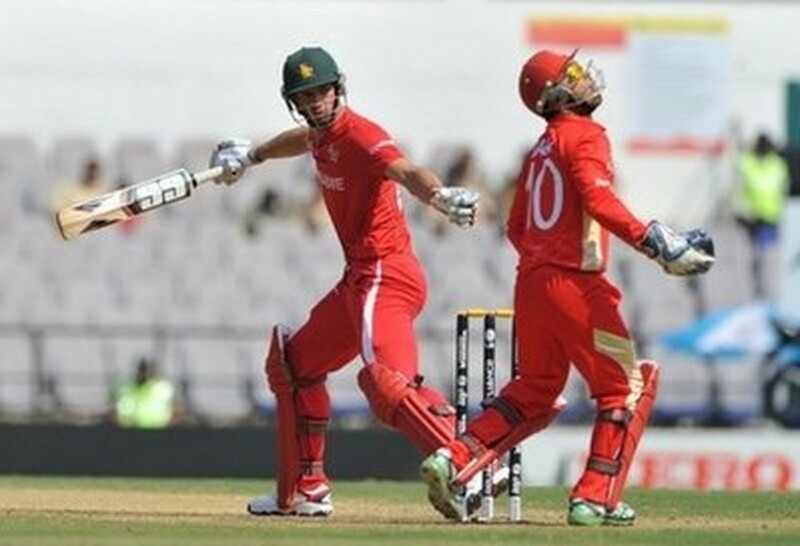 Both sides lost their opening matches, Zimbabwe going down by seven wickets to Australia while Canada suffered a 210-run mauling in Sri Lanka. Meanwhile, World Cup favourites India came under fire from a demanding media after their dramatic Sunday tie with England as fallen giants West Indies looked for their first win against the Netherlands. In a gripping contest on Sunday that injected life into a tournament that has seen a series of lopsided matches, the home side scored 338 all out in Bangalore thanks to a crowd-pleasing century from Sachin Tendulkar. But in dramatic scenes under the floodlights at the M. Chinnaswamy stadium, England, led by skipper Andrew Strauss with 158, levelled the scores on the final ball of their innings. Despite the excitement, India's media said the match should serve as a wake-up call, bemoaning the hosts' failure to beat England and lamenting lacklustre fielding and a bowling line-up that lacked penetration. "Top-rated India get wake-up call from England", said the front page of the Daily Mail, which relegated news of the government's impending budget onto an inside page. "It must be said that the collective failure of the frail Indian bowling attack allowed the visitors to come back into the match several times," the newspaper said. The Hindustan Times asked: "Will just putting runs on the board be good enough to win the World Cup?" "It could happen, but will require a lot of luck. When compared to most champion teams of any era, this team suffers in terms of all-round balance." The Times of India blasted the Indian attack as one of the worst in the Test world. "At the moment, we don't look good enough to defend any total. But the good news is that our weaknesses have been exposed in a non-knockout game. They can still be rectified." Strauss, whose century earned him the man-of-the-match award, said his side had put down a serious World Cup marker. "Coming into this game after the Holland performance, it was a great bounce-back and showed everyone around the tournament that we're going to be a force to be reckoned with," said Strauss, whose side had a major scare against the Dutch in their opener. India captain Mahendra Singh Dhoni praised left-arm quick Zaheer Khan for a burst of three wickets for one run in six balls, including two in two to get rid of Ian Bell (69) and Strauss, that swung the match back India's way. But he said it was India's fielding, long their Achilles heel, that had cost them a second victory of this tournament to set alongside their 87-run opening win over co-hosts Bangladesh. And he hit out at the controversial Umpire Decision Review System (URDS) after a key decision went against his side. The crucial stand between Strauss and Bell was worth just 52 when left-arm spinner Yuvraj Singh thought he had Bell lbw on review for 17, with replays showing the ball would have hit the stumps. Bell had started to walk off but because New Zealand umpire Billy Bowden's verdict was not out, the decision was returned to him by Australian replay official Rod Tucker and the Kiwi deemed Bell to be too far down the pitch. India have stood alone among major nations in refusing to use UDRS in Tests after getting on the wrong side of the system during a series away to Sri Lanka in 2008 where several reviews went against them. "The adulteration of technology with human thinking meant we didn't get that (Bell) wicket," said Dhoni. "If Hawk-Eye says it's good and going to hit middle stump, I see no reason why the distance matters," said Dhoni. On Monday, the West Indies were due to play the big-hitting Netherlands in New Delhi. The Caribbean side were well beaten by South Africa in their first Group B clash, a result that saw the former undisputed kings of the one-day game slump to ninth in the one-day rankings.